Floor cleaning machines offer a number of utilitarian and cost-effective benefits. They are associated with cutting-edge technological advancements, they are more efficient than ever before and modern units can address large areas within an amenable time frame. Still, operators and management alike need to be aware of the proper protocols if they hope to maintain a safe workplace. Let’s take a look at some top tips intended to ensure that all workers are prepared in advance. Many machines employ fluids that are maintained under a significant amount of pressure. One example can be seen in hot water pressure washers. Operators should examine the integrity of all seals and valves before use. The same holds true for any kinked or frayed hoses. This can prevent potentially dangerous levels of pressure from harming workers or anyone nearby. The use of personal protective equipment (PPE) should always be enforced within the workplace; particularly when handling large floor-cleaning machines. Back braces, hard hats, polycarbonate goggles, and waterproof gloves are some common examples. Depending upon the unit in question, it could also be necessary to equip workers with adequate ear protection in order to prevent long-term issues such as tinnitus. 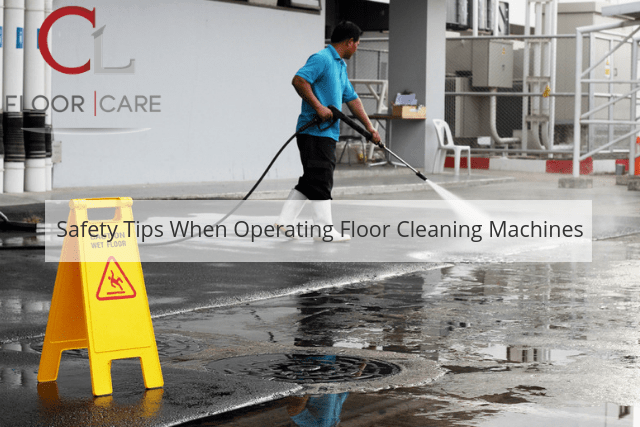 There are a number of potential hazards present when operating large mechanical devices such as floor sweepers, mechanical scrubbers and commercial vacuum cleaners. Ride-on units should be used with an attached safety belt in the event that a worker slips during operation. It is just as important to make certain that the area intended to be cleaned is unoccupied at the time. Many of these machines are quite loud and it can be difficult for operators to sense the presence of others. This is also why the appropriate warning signs should be put in place well in advance (such as folding A-frame safety signage). It is also wise to cordon off the entire area in the event that chemicals will be used during the cleaning process. The safety concerns highlighted above should never be taken lightly. It is also prudent to appreciate any guidelines or regulations which may apply to a specific region or industry. Understanding the protocols associated with floor-cleaning machinery is the responsibility of everyone within the work environment. Safety is certainly no accident. Adopting the proper approaches early on is the best way to avert any unfortunate situations.